The following was reported in late 2007 and early 2008. Phil Stoffer squinted through the glass to see a sign of the past and, almost certainly, the future of this part of California. He knew what he was looking for and grinned when he found it. It was a crack, a big one. Stoffer held a hand near his wire-rimmed glasses to block the glare and traced the path of the crack as it ran along the high ceiling, then down a sea-green wall. Smaller cracks fractured the wall farther down and along a sweeping flight of stairs to the floor. We were in Hayward, California, a small city across the bay from San Francisco, south of Oakland, north of San Jose. We stood in a little alcove pressing our noses against the outside of a modest side door. We were looking into what was, once upon a time, Hayward City Hall. It looked the part. It was an imposing concrete structure painted a sandy beige. It had a cornerstone inscribed MCMXXX and was decorated with geometric art deco flourishes and cornices shaped like the heads of cattle and goats. On one side of the building was busy Mission Boulevard, where Stoffer’s car was parked, and some landscaped grounds. Near its southern corner was a shiny, new playground where children swung back and forth through the air. There were a few other buildings on the block, but this one was abandoned, full of broken windows and old office equipment. Stoffer pointed out more cracks. The answer to that question is unsettling: the Hayward Fault is under one town after another along the eastern edge of San Francisco Bay. In his guide, Stoffer describes sites along the fault that are of historical or geological interest. He also highlights locations where locals can reach the fault by bicycle, foot, or mass transit (but not by car—it’s subtitled “A Green Guide to the Fault.”). The day we visited Hayward, we were going to add a few more sites to his guide. Stoffer set off past the expansive set of concrete steps at the city hall’s main entrance and ambled along a cement sidewalk around the corner of the building. He carried a coffee cup and wore blue jeans and a plain gray sweatshirt with the initials USGS printed in small letters on the front. I followed him around the corner. Several feet in, the sidewalk on that side of the city hall abruptly shifted to the right, putting a kink into the straight ribbon of cement. It looked as if the workers who laid it down realized, after planting a few squares of cement, that they had misread the plans by a couple of inches. In a parking lot full of cars north of the old city hall, Stoffer pointed to a red brick building with dozens of metal plates screwed into the walls. “Classic retrofit,” he said. He continued north and admired several curbs that had been either cracked or warped severely, each one veering to the right and then straightening again, as if correcting course. We stopped in another parking lot and Stoffer paced back and forth along a series of cracks in the asphalt, each about a foot long. The cracks were parallel to each other and scudded along an invisible line through the parking lot, like the wrinkles at the corner of a smile or a string of Christmas lights. “These are en echelon cracks,” Stoffer said. They had formed because the Hayward Fault was directly underneath the parking lot. As the chunks of earth on either side of the fault crept past each other, the moving earth tugged at the asphalt above, cracking it. The fault also created the kink in the sidewalk, and the bent curbs; it’s the reason the old city hall was cracked and abandoned. They did. He asked how much it might cost to make a little green dinosaur. He had been toying with an idea for another project, which he declined to describe. He asked how much neon lettering costs. The woman told him that the price depends on the number of bends it takes to make each letter. He asked her what she thought of working on top of a fault. A couple of weeks earlier, an earthquake occurred near San Jose, on yet another Bay Area fault, the Calaveras. The Bay Area took notice—it had a magnitude of 5.6 and was felt throughout the region. The next day, the San Francisco Chronicle warned that this quake increased the chances of earthquakes “along the much more dangerous Hayward Fault.” Stoffer thought of it as the “perfect” earthquake. Perfect because it did so little damage, yet was big enough to be widely felt and covered by all the local media. It reminded locals that they live among active faults. And it gave Stoffer and his colleagues an opportunity to talk about the threat posed by the Hayward Fault, as well as the need to be prepared. The exit for Lake Temescal was poorly marked. Stoffer’s first glimpse of it was at 40 miles per hour as he zipped past, consequently merging from highway 24 onto the Warren Freeway. He took the nearest exit and hooked onto a street called Broadway Terrace; it shunted us up a steep hill and into the affluent upper Rockridge section of Oakland. Far below were Lake Temescal and the fault. After a few more turns, Stoffer pulled into the parking lot at Lake Temescal. One side of the lot was hemmed in by a steep hillside—the same hill Stoffer had just crested. At the very top was a house that looked like it was built on the crowns of the trees below it. A little push, it seemed, and the house might tumble into the lot. Stoffer rummaged in the back seat and pulled out a tripod and a pair of small digital cameras, which he screwed onto a metal bar on the top of the tripod. As part of his field guide, he was also including 3-D photographs of cracks, buildings, or the scenery—thus the twin cameras, which, like a pair of eyes, would produce a stereoscopic view. He walked over a green, manicured knoll to get a better view of the lake. Temescal is a sag pond , dammed at one end to hold water, that formed in a depression in the ground—a sag—created by the Hayward Fault. During hot summer days, it is a popular swimming spot. On its northeast shore is a small stretch of beach and nearby is a stone house built by the Works Progress Administration. But that November morning, the kids who might otherwise be found there were in school at nearby Chabot Elementary and College Prep. The lake was quiet, its surface interrupted only by a few ducks. A light fog hung overhead, and the leaves on some of the trees had turned. It looked like a Hudson River School painting. Stoffer took a couple of snapshots and then strode across the grass in search of signs of the fault. He studied several cracks in a paved hiking path, but didn’t think they showed anything. He wandered closer to the highway and sized up several ruptures in the pavement. Tree roots, he decided. The Hayward Fault runs along the length of this valley. It’s believed to be the reason the valley exists, its motion enabling the forces of erosion to carve the valley out more easily. But Stoffer was searching for signs of creep. He wasn’t having any luck. “The little effects,” Stoffer said, “aren’t anything tremendous. But it’s an amazing story.” Still, those little effects are only the faintest harbingers of the fury buried miles below the surface. The fault extends about eight miles below ground, and the sections of earth along the fault below the three-mile mark—the part that’s not creeping—are stuck to each other. Because they aren’t moving, they are building up the stress that fuels a big earthquake. A recent USGS map shows many of the fault’s active surface traces, a series of bold red lines that underlie homes and offices and roads. But in some places, like Lake Temescal, the line peters out, replaced by a timid little thread showing where the trace of the fault probably is. Stoffer wouldn’t be making that red line any bolder the day he visited. Photo from Bancroft Library and the Online Archive of California. At 7:53 in the morning on October 21, 1868, a major earthquake struck the Bay Area. It had a magnitude of about 7, scientists believe. It occurred on the Hayward Fault. The shaking lasted for more than 40 seconds and damaged property throughout the Bay Area. Thirty people died. It was known as the “great quake” until the 1906 earthquake supplanted it. Most of the buildings in Hayward suffered severe damage or were destroyed. As one USGS publication notes, “few places have paid so dearly to have an earthquake fault named after them.” This is the earthquake that Tom Brocher and his 1868 Hayward Earthquake Alliance want people to know about. Brocher does not look forward to another earthquake. He remembered the 1989 Loma Prieta earthquake, the last major quake to hit the area. It’s an 1868-style earthquake that worries Brocher and the alliance. The Bay Area was far less developed in 1868. Hayward was a town of about 500 people; San Francisco had 150,000 residents. More than five million people would feel a Hayward quake today. A trillion-and-a-half dollars worth of property would be at risk. Those figures come from a company called Risk Management Solutions, headquartered in a corporate office park in Newark, south of Hayward, along the edge of the bay. Its specialty is modeling catastrophes and quantifying their risks for insurance companies—whether earthquakes, hurricanes, terrorism, or plagues. A portrait of Tetsuya Fujita, whose name puts the “F” in the F-scale of tornado strength, hangs in one hallway. In the lobby, display cases hold free reports on China’s 1976 Tangshan earthquake and the threat of a flu pandemic. RMS predicts losses of about $165 billion worth of property. Of that, $75 billion would be commercial; the remaining $90 billion would be residential property. “They’re staggering numbers,” said Mary Lou Zoback, vice president of earthquake risk applications at the company and a geophysicist. Only a fraction of that is covered by insurance, and, after deductibles and limits to coverage, insurance companies are only on the hook to pay about $4.5 billion to homeowners affected by a quake. The 1995 earthquake in Kobe, Japan, helps put the potential damage from a Hayward quake in perspective. Kobe is sited along the Osaka Bay, and its Nojima Fault is the same kind and roughly the same length as the Hayward Fault. It is a major population center bound by mountains on one side, water on the other, and heavily populated flat land in between. In Kobe, a phenomenon called liquefaction was a major source of damage. When liquefaction occurs, the ground loses stability because it is saturated with water. As a result, buildings, sidewalks, roads, and other structures can sink or tip over. Geologists expect similar damage along the margins of San Francisco Bay, as well as strong shaking throughout the flatlands. The Oakland and San Francisco airports, as well as all port facilities, may be severely affected. Much of the major infrastructure of the region has been, or is in the process of being, retrofitted to improve its ability to withstand earthquake. But homes and businesses are another thing. In 1996, the Earthquake Engineering Research Institute released a report on the possible effects of a Hayward quake. One chapter is entitled “Commercial and Residential Buildings Affected by Ground Motions.” It was written by a structural engineer who traveled along the fault, highlighting buildings that he expected would be damaged or destroyed. Twelve years later, he doesn’t think much has changed. During that century, much of the infrastructure of the Bay Area was built: the freeways, the bridges, the skyscrapers in San Francisco, the continuous band of homes and businesses along the Hayward Fault. Brocher contrasted this with the half-century before 1906, when earthquakes measuring in the magnitude five to six range occurred every two or three years. Brocher thought that if these kinds of earthquakes happened more often, it would spur greater preparedness. Brocher opened a drawer in his desk and pulled out a booklet called “Putting Down Roots in Earthquake Country,” a guide describing the region’s seismic situation and how residents can strengthen their homes. He flipped to a chart showing the number of known earthquakes higher than magnitude 5.5 since 1836. Each earthquake was represented by a rectangle that indicated its size. The largest rectangle was in 1906. The 1868 and 1989 earthquakes also figured prominently. From 1928 to 1968, there were no notable earthquakes at all. 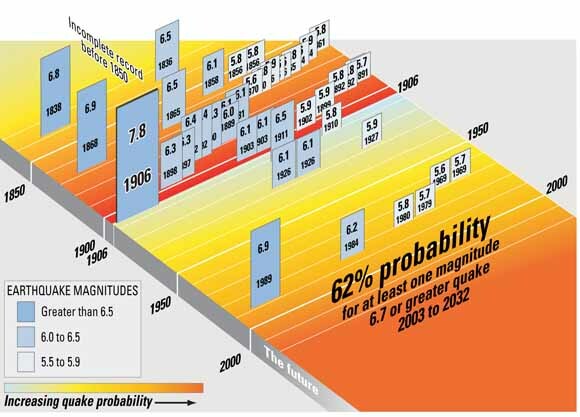 The timeline stretched into the future, showing a 62 percent probability of at least one earthquake of magnitude 6.7 or higher by 2032. “We call this the tombstone diagram,” Brocher said. “Any reason I can’t park here?” Stoffer asked as he stopped his car in what was clearly not a parking spot. The Claremont Hotel and Spa nudges against the fault for about a fifth of a mile and he wanted some pictures of the building. He had navigated through a couple of small lots on the Claremont property, but all were full. He ended up on a triangular wedge of asphalt on one of the hillside lots overlooking the building. Stoffer stepped out of his car to a commanding view of the shimmering white hotel: white walls, white roof, white tower. He set up his tripod with the dual cameras and leaned back, squinting at each of the cameras. He snapped a pair of photos for his field guide. I asked him if he had made the camera rig himself. “Oh, yeah,” he answered. Then joked, “Boredom.” Stoffer has been shooting 3-D photographs for years. One of his biggest projects is a web site highlighting the geology of the Southwest’s national parks. His office is like a museum of fossils and crystals he’s collected over the years. On one wall, over his desk, is a mounted jackalope head. It wears a pair of red and blue 3D glasses. Stoffer headed down the hill to the entrance. Valets scurried under a green awning, helping new arrivals with their luggage and their cars. A stylish young woman hurried out of the building, talking into her cell phone about a spa appointment. Stoffer walked past the valet station to what looked to be a small maintenance passage. According to his map, a known trace of the fault was less than a hundred feet away. He noticed some cracks in the wall, then leaned close and looked along the plane of the wall. It was slightly warped. A nearby cement planter appeared to be pulled apart. And, in the valet parking lot, between a pair of late-model Mercedes sedans, Stoffer spotted what he called a pull-apart offset, creating a tiny rift in the fresh blue-black asphalt. None of this was definitive, but all of it, as far as Stoffer was concerned, was highly suspect. “It’s a tough game to find creep movement,” a geologist named Jim Lienkaemper said one afternoon in his office at the USGS. The evidence around the Claremont, for example, has always been “kind of iffy stuff.” Lienkaemper has been studying the Hayward Fault for 20 years. A fresh printout was taped to his door. It was a graph covered with little hieroglyphics, the product of his latest Hayward Fault survey. Each fall he maps it again, surveying the infinitesimal distances that different sections of the fault crept during the previous year. Over the last few millennia, the earth along the fault has moved an average of about nine millimeters every year, almost four inches. That number is the combined movement from both the gradual creep and the abrupt slip along the fault from a quake. Measuring the amount of creep at a given segment of the fault gives an idea of how much movement might occur in an earthquake. In other words, if Lienkaemper measured nine millimeters of creep each year along some segment of the fault, he wouldn’t expect major slip there during an earthquake because all of the tectonic energy was being released. But the average creep rate along the Hayward is about 4.5 millimeters each year, not far enough to release all that stress. In a big earthquake, he speculated that sudden ground movement of a meter or more might be seen on the surface. Back in the Claremont parking lot, Stoffer approached the valet station. An attendant asked if he could be of assistance. “Do you know where the Hayward Fault is?” he asked the valet. The valet looked puzzled and thought for a moment. He scratched his head. “Doesn’t it run through Cal Stadium?” he asked. Stoffer grinned and swung his arm toward a spot beyond the Mercedes sedans. “It’s right there!” he said. The valet smiled politely, but didn’t say anything else. The 1868 Earthquake Alliance held its April 2008 meeting in an Oakland building undergoing a seismic retrofit. In the lobby, plywood and plastic sheeting was scattered along the walls. Inside of a conference room, thirty people had gathered to talk about the Hayward Fault. There were several geologists in attendance, including Tom Brocher, Jim Lienkaemper, and Phil Stoffer. Some people were from local businesses, others from local governments. One was a newspaper reporter. Mary Lou Zoback, from Risk Management Solutions, talked about the property loss figures from a hypothetical quake. She added that the worst damages were likely to occur in the among the poorest populations, and that disaster planning needs to account for the numerous languages spoken by the people who live in these areas. “Ouch,” said one of the attendees. “It’s better than 5:12,” countered Zoback, to laughter. She was referring to the annual 1906 commemoration in downtown San Francisco—timed to coincide with the early morning moment of the 1906 quake. In 2006, Zoback, then at the USGS, held the same regional coordinator position that Brocher has now, and was a leader of the 1906 Earthquake Centennial Alliance, established for the same reason as the 1868 Alliance. Brocher declared that he wanted to try educating the public about preparation in new ways. He wanted awareness events to be more fun. He floated the possibility of hiring an airplane to fly above the fault, pulling a banner that said, “Drop, Cover, and Hold.” These are the instructions for what someone should do during an earthquake: drop to the floor, take cover under something like a table, and hold on until the shaking stops. One of the businessmen said that Brocher would have to make it clear this was an educational message, not a warning. Otherwise, he worried, people would expect something to drop out of the plane. According to a 2007 Bay Area Red Cross survey, 83 percent of the region’s population is not prepared for an emergency. While government and large institutions like the University of California have been working to upgrade facilities and infrastructure to ride out a big quake, Zoback and others point out that while this may sound reassuring, the projects aren’t complete. The most visible example is the new eastern span of the Bay Bridge, which is scheduled to open in 2013—24 years after the Loma Prieta quake exposed its vulnerability. Meanwhile, Ronald Hamburger, the structural engineer who wrote about which buildings might fall in the 1996 scenario, cautions that the situation among privately owned buildings is far from ideal. He admitted that his own home, two thousand yards from the San Andreas Fault, hadn’t been upgraded for a large earthquake. When he bought the house, he decided at the time that the risk of having an earthquake while he owned it, and with the amount of money he had at the time, didn’t warrant the expenditure. Two decades after buying his home, Ronald Hamburger changed his mind and decided to install seismic upgrades in his home. Hamburger was remodeling his kitchen and in the process would install shear walls to strengthen his house against shaking. I asked him if he might also be installing granite countertops. So one size does not necessarily fit all in terms of disaster preparation. (When I asked Zoback what the ultimate preparation would be, she thought for a moment, then wryly responded, “A second home in the Sierras.”) To someone like Ana-Marie Jones, that is the elephant in the room. She keeps a little pink plastic elephant stuck to the window of her office as a reminder. Jones is the director of an Oakland organization called Collaborating Agencies Responding to Disasters. Despite the name, she has chosen not to participate in the 1868 Alliance. She helps educate what she refers to as vulnerable populations. Her long list of the vulnerable includes people with physical and mental disabilities, immigrants, single parents, the elderly, the homeless, pregnant women, even tourists. Jones believes most advice is tailored for stable families who own their own homes. It doesn’t take the full range of populations into account. Fear, to Jones, is bad strategy. It shuts people down. She keeps extra copies of a study by the American Red Cross published 16 years ago that concludes that using photos of destruction increases avoidance and denial behavior, keeping people from preparing for future disasters. “I don’t believe you could come here, invest in a home, buy a car, fall in love, and have a happy, happy life, if, every moment of that life, you had to be sitting here thinking, ‘Any minute now, the earth could open up. I could lose my home. My friends could die.’ I just don’t believe we can sustain that,” Jones said. She started working full-time in preparedness education after the 1989 earthquake. Before that, she spent a decade in advertising and market research. That’s the approach she believes will work. She encourages people to start small and build on decisions that leave them feeling more confident right away. She distributes tiny flashlights and whistles that can be attached to key chains or backpacks. She wore a necklace with a whorled green and white globe hanging from it. When I asked her about it, she took it off and opened the globe. It was a locket made from silver and glass. Inside was a $100 bill. Still, it is difficult to divorce the preparation from the disaster. Pam Grossman is a compact grandmother who lives in the Berkeley hills. One afternoon, she unlatched a couple of padlocks on the gray plastic shed near her garage. Her husband, Elmer, sat on a porch nearby, eating a sandwich and reading a copy of the New York Review of Books. She opened the doors and began to shuffle through its contents. “You can’t have enough masks, goggles, and gloves,” she said. Grossman picked up a nozzle that, attached to a garden hose, would create a high-pressure flow to fight the fires that flare up after a quake. “But the problem in Berkeley,” she said, “is the pipes are more than 100 years old. So they’ll probably disintegrate.” Mylar blankets, hard hats, and a medical kit sat on the shelves. On the ground, there was a 10-horsepower generator as well as some water containers. Grossman hefted a tool called a “come along,” which she expects will be used to lift large objects like tree branches or fallen beams. She put that down and picked up a Reliance brand “luggable loo”—a plastic toilet seat that can be fixed to a five-gallon bucket. Grossman received most of these supplies from the city of Berkeley because she manages her neighborhood’s emergency response team. It includes 45 households and has been active for 20 years. They are organized under the premise that emergency crews will be too overwhelmed after a quake, and so the neighbors will have to step in. Grossman and her husband, a retired pediatrician, make up the medical team. While Grossman has made it her mission to visit other neighborhoods and help them organize, she isn’t sure that’s enough. I asked her what she thought would motivate people to take preparation seriously. “I think it’s gonna take a serious earthquake,” she said. Then she acknowledged that this would be too late. As for neighborhood emergency response teams, Jones acknowledged that they can be useful, but difficult to sustain. “It’s hard to get people wanting to think about disasters,” she said. Phil Stoffer entered the Berkeley campus with a trick up his sleeve. He pulled his car up to the lot attendant just outside of the university’s Memorial Stadium. “I’m a geologist,” he told the attendant, who shrugged and waved him in. Stoffer walked into the northern end of the stadium, pausing to admire (and photograph) a vicious crack that cascaded down an interior wall. He continued onto the field, where he took a photo behind the goalpost, then walked to the southern end of the stadium. At section KK, he began to climb the bleachers. Stoffer stopped on the very top, at a long yellow bench. Row 74, section KK. Behind the bench was a five-foot cement wall, the outer rim of the stadium. It was split vertically into two pieces. This wasn’t a crack, though there were cracks running alongside. It was an expansion joint built into the stadium structure. The Hayward Fault, above which the stadium is built, had taken full advantage. Since the stadium opened in 1923, the fault had slowly pulled it apart and opened a gap wide enough for a fist. The top was capped by a piece of rusty metal attached with rusty bolts to the concrete. A spectator could look through the wall, past the concrete and a naked piece of rebar, and see Oakland to the south. Stoffer paused to catch his breath after the climb up. He was excited, and seemed genuinely happy. And he took a picture. Nice article man. I feel like going on a tour just to see all of this stuff for myself. I still haven’t seen the stadium in person. We’ll have to go exploring one of these days.